This is an advertisment for Jeye's Disinfectant. 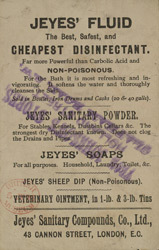 The first product sold by Jeye’s was ‘Jeye’s Fluid’ and even today they still sell disinfectants. The company was acquired by Cadbury Sweppes in 1972.